Blurb- "They turned to see his tears of love wiping away her blood of agony..."
Diya throws Suraj's proposal back in his face, leaving him broken-hearted. Why would she do so when she loved him desperately? Suraj finds his Guruji unconscious beside a cave clutching the warrior Indrajith's diary. His heart-rending love story then unfolds. Being trapped in a web of emotions, Indrajith endured the pain of his lost love, hurting himself and trampled Deepali's hope for his adopted brother... Who was he? Sealed for centuries and holding the Mann-Parivarthana astra, the cave is besieged by evil now. But all attempts to unlock it go futile. Faced with baffling hints, Suraj's intelligence is sorely tested. What is the potent power required to break through that Paanch-Dost-Gupha? Will the fire of love ever flicker in the hearts of Diya and Suraj? Review- The Flames of Anahata is the second book of the Comeback Warrior Trilogy and even though I haven't read the first book of the trilogy, this book was still a good read. This book is a mixture of Thrill, Romance and Mystery. I received a free copy of this book from Kalamos Literary Services and Anuj Kumar in exchange for an honest and unbiased review. Book Cover and Title- Book Cover is very interesting, but I failed to see any connection between the cover and story. The tittle is appropriate and the word 'Anahata' has a deeper meaning in the story which was interesting to read. Language and Narration- The language used is simple and easy to comprehend. Narration is done well and binds readers with the book. Editing is also done well and the book is without any grammatical errors. Characterization- Saranya has done a great job portraying her characters. All the characters are having their little stories which makes the overall book an interesting read. Even the side characters are justified properly. Storyline and Plot- Storyline of the book is simple with some twists and turns and follows a simple plot. There are two stories running parallel and are separated by the time. I liked the way the author has balanced the present and past story and the reader does not get confused between them. I liked the story from past more interesting than the current story. The pace of the book is neither too fast nor too slow and flows continuously till the end. 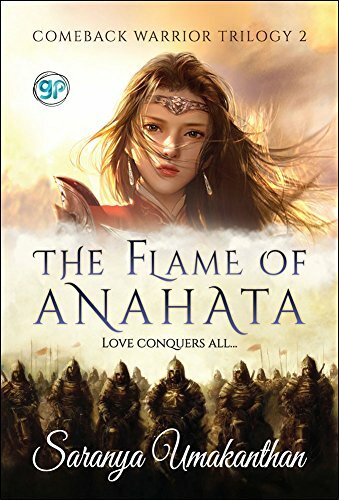 Overall, The Flames of Anahata is a good book which delivers us not so unique plot, but smooth storyline with well justified characters.